Bring 2 quarts salted water to a boil in a large pot over medium heat. Add asparagus and cook until it turns bright green and is crisp tender. Plunge into an ice bath. Return the water to a boil and add the shrimp; return to a low boil and simmer 3 minutes or until just opaque. Plunge into an ice bath to cool; peel, devein, and chill completely. Add lettuce to salad bowl. 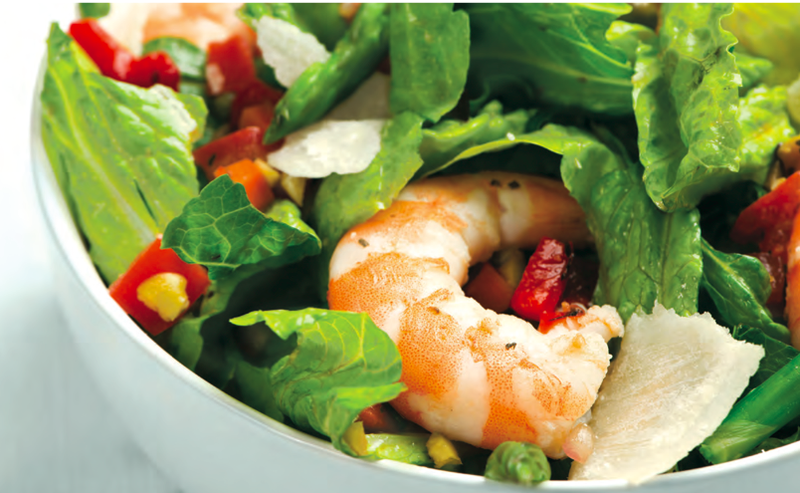 Evenly layer shrimp, tomato, peppers, anchovies, and green onions atop lettuce. Top with Olive Salad and toss well. Divide into salad bowls and scatter Parmesan on top.